Acoustic Triangle appeared in two concerts with the fabulous Royal Holloway Choir in autumn 2014. 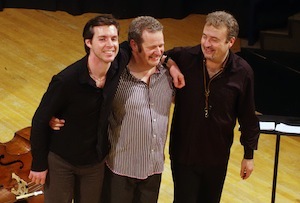 Malcolm Creese, Tim Garland and Gwilym Simcock continued their fruitful association with the Royal Holloway Choir, directed by Rupert Gough, with two concerts last autumn. The first was on 30th October at Royal Holloway College in Egham, and the second in Dorchester Abbey, near Oxford on 1st November. 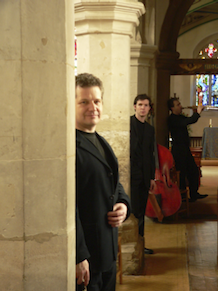 Music from seven centuries was performed, including a unique arrangement of Gregorio Allegri's famous 'Miserere Mei' and works by Henry Purcell, Tim Garland and Gwilym Simcock. The trio also played a short tribute to the extraordinary trumpeter and composer Kenny Wheeler. 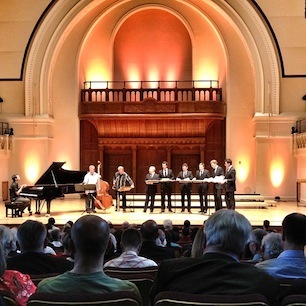 For two concerts in June 2013, The King's Singers joined forces with Acoustic Triangle - Malcolm Creese (double bass), Tim Garland (saxophones) and Gwilym Simcock (piano) - to pay tribute to two legendary musicians, Richard Rodney Bennett and George Shearing, in concerts at Cadogan Hall in London and St. John the Evangelist in Oxford. The performances were hosted by radio presenter, conductor (and former King's Singer), Brian Kay. At the London performance, Brian also lead a pre-concert talk to explore the lives and music of these outstanding artists. Joining the discussion were members of The King's Singers past and present, Lady Ellie Shearing, Malcolm Creese, and other friends and musicians who worked with George Shearing and Richard Rodney Bennett. 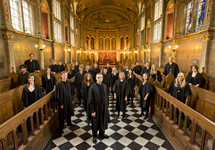 The London concert also featured the Choir of Royal Holloway, performing two pieces by Sir Richard Rodney Bennett, including the second performance of 'A Colloquy With God' - a Swaledale Festival commission which he composed for the Choir and Acoustic Triangle shortly before his death in 2012. Both concerts were very successful and well received by audience and reviewers. Many thanks to all who attended. In May 2012, Acoustic Triangle performed at the Swaledale Festival in North Yorkshire - alongside the superb Royal Holloway Choir, conducted by Rupert Gough. This special concert featured the world premiere performance of a brand new work by Sir Richard Rodney Bennett. The piece, which was specially commissioned for this concert by the Swaledale Festival, is entitled A Colloquy With God. Sir Richard Rodney Bennett was present at the concert, which also featured Gregorio Allegri's iconic Miserere Mei, Purcell's Hear My Prayer, Tim Garland's Canticles of the Elements and Rosa Ballerina, Gwilym Simcock's Plain Song, and pieces by Gabriel Jackson, John Rutter and Eric Whitacre. The three members of Acoustic Triangle are equally at home in classical music and jazz, and their work seeks to blur the perceived boundaries between these genres. Individually, their careers have taken them all over the globe - with musicians such as Mark Anthony Turnage, John Williams, James Galway, Chick Corea, Dave Holland, Art Farmer, Joe Lovano, Cleo Laine, Lee Konitz and Sting. Together they have become one of the most original and respected British ensembles, having recorded four albums and performed in major concert venues and festivals all over the world - always without amplification. The group is widely acknowledged for its ground-breaking site-specific work, particularly in sacred buildings, and has performed in most of Britain's ancient Cathedrals. Acoustic Triangle's music contains a wide variety of influences - from ancient themes and folk styles through impressionism and the jazz era to the avant-garde. Emphasis is put on melody, extended structured composition, spontaneous improvisation and thrilling interaction between the players. 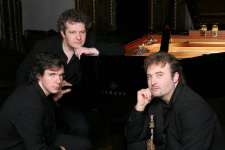 Much of the group's repertoire is specially composed by Tim Garland and Gwilym Simcock, but it also includes music by Kenny Wheeler, John Taylor, Bill Evans, Chick Corea, G. F. Handel and Maurice Ravel. 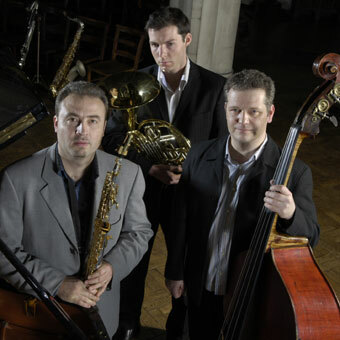 Since its inception in 2000, Acoustic Triangle has undertaken a number of special collaborative projects involving Gerard Presencer, Kenny Wheeler, Asaf Sirkis, Liane Carroll, the Sacconi String Quartet, Carolyn Sampson, Northern Sinfonia, the BBC Concert Orchestra and the Choir of Westminster Abbey. Acoustic Triangle rehearse Jubilate Deo by Tim Garland with the Choir of Westminster Abbey directed by James O'Donnell on Ascension Day 2006. 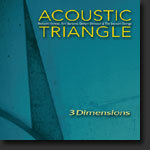 Acoustic Triangle took it's musical exploration of inspiring buildings to new heights in 2008. The acclaimed trio, joined by six world-class string players including the Sacconi String Quartet, toured the UK's Cathedrals and Abbeys in a celebration of sound and inspiring architecture. Award-winning composers Tim Garland and Gwilym Simcock wrote new music for the tour. In fifteen unique three-dimensional performances, musicians appeared from all around the building - their sounds echoing, developing and surprising. 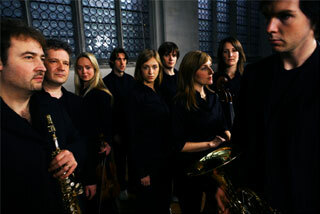 The nine players are: Malcolm Creese (double bass), Tim Garland (bass clarinet, saxophones, flute), Gwilym Simcock (piano, French horn), Ben Hancox, Hannah Dawson, Charlotte Scott and Emma Parker (violin), Robin Ashwell (viola) and Cara Berridge (cello). My friends and I did enjoy last night at Turner-Sims. We thought it was the best we heard Acoustic Triangle play, having first heard you at the Gower Festival in 2007 and subsequently at Turner Sims and Romsey. Tim's blowing seemed especially free last night. All the best for the next 10 years! Yesterday evening I attended the St George service/liturgy in Manchester Cathedral. I just want to say I cannot recall listening to such a magnificent performance as your singing, and the playing, of that long piece while the St George cross was being made. It was simply wonderful. It was liquid gold. It was spell-binding. The quality of music playing and singing was incredible. Tell all three instrumentalists, tell the conductor, tell every single member of the choir. And where is there a recording of it that I can purchase? We really enjoyed the brilliance of Acoustic Triangle last evening, it was a memorable occasion. I think you must be really pleased - what a wonderful wonderful performance - Rodger and I totally agreed that this is how music should be - great musicians in a lovely friendly environment where everyone feels involved. What a great evening, Jack! And a good room as well. Many thanks for Sunday evening. A really memorable event. I have seen Acoustic Triangle playing five times now and if I had to make comparisons this was the best so far... Wonderful. Congratulations on last night's concert. It was superb and being able to use the Grimsdyke music room was a bonus too! Well done! It was hugely successful I thought. The venue worked - and you even organised food! Everyone appeared happy. As for the music, well, even though I was only there for half the gig, I felt high with it and still do. What a trio.